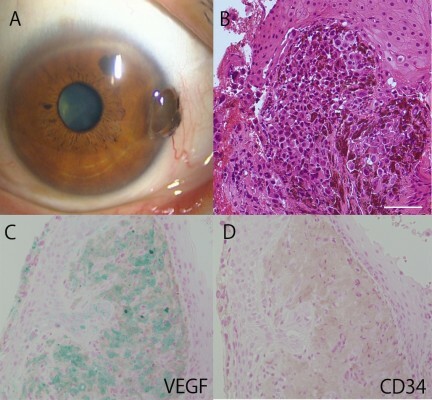 Purpose: The aim of this study was to examine the immunolocalization of VEGF-A and CD34, a marker of endothelial cells, in human conjunctival melanoma. Methods: This study retrospectively analyzed primary conjunctival melanoma patients who underwent surgical resection of the tumor. All excised tissues were fixed with paraformaldehyde and embedded in paraffin, which were then submitted for immunohistochemistry with anti-VEGF and CD34 antibodies. Results: The study sample comprised 4 female and two male melanoma patients. The age of the patients ranged from 64 to 84 (average age, 73) years. Histopathology of the surgically resected tumor tissues demonstrated accumulation of polygonal atypical malignant cells producing melanin. Cytoplasmic immunoreactivity for VEGF was clearly observed in tumor cells of all six tumors. In contrast, CD34-positive endothelial cells were less marked in the melanoma tissues than in the adjacent noncancerous subconjunctival stroma. Conclusion: VEGF immunoreactivity was observed in conjunctival melanoma tissues, in which endothelial cells were hardly observed. These results suggest that although VEGF is expressed, conjunctival melanoma is a hypovascular tumor.